In short: An exciting new take on the classic Gullwing. The Mercedes-Benz SLS AMG—the first car developed from the ground up by the maker's AMG subsidiary—blends retro styling with high-performance engineering to create a super fun supercar worthy of the elite SL title. 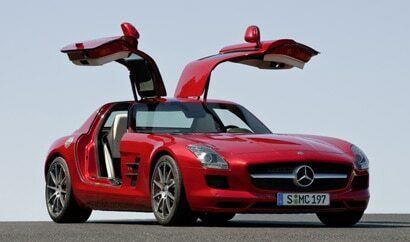 Borrowing the gullwing doors and elongated body style of Mercedes' iconic 300SL, the SLS AMG possesses the exuberant character and charisma of its predecessor, with the added benefit of a 6.3-liter, 563-horsepower V8 engine capable of rocketing the sports coupe from 0 to 60 in a whiplash-inducing 3.6 seconds.